Reload Internet is a professional photo studio that is dedicated to providing you with all your passport, ID and visa photo needs, and can produce your French Southern Territories passport photo or visa photo today. We are located on Praed Street in Paddington, the same street as Paddington train and tube stations, and stay open 7 days a week from early morning until late evening, allowing you to come and visit us easily at a time that suits you. We have a team of experienced photographers that will assist you with your photograph straight away, no need for an appointment, and will provide you with a set of high quality photographs that guaranteed to pass at the French Southern Territories with your application the first time round! All of our photographs come with a 100% guarantee to pass first time, without any issues. 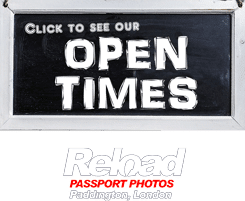 So why visit anywhere else, come to Reload Internet in Paddington, London, for you French Southern Territories passport photo or visa photo today! We will provide you with a set of high-quality photographs, at an affordable rate, which are guaranteed to pass. We will capture your photograph using the latest in camera technology, and will then check with you to ensure that your photo is satisfactory. After we know that your are happy with the image, we will cross-check the photo with the official French Southern Territories passport photo and visa photo guidelines released by the Embassy. We will then print out your photographs using embassy-approved digital photo printers, and will cut them to the exact sizing required by the Embassy. This is why our service is unbeatable, and why all of our customers are satisfied with the experience they receive. Yoru French Southern Territories passport photo or visa photo must meet the necessary requirements listed below, otherwise it will be rejected when you attempt to submit it along with your application to the Relevant Embassy. Visit Reload Internet today to ensure this does not happen to you! 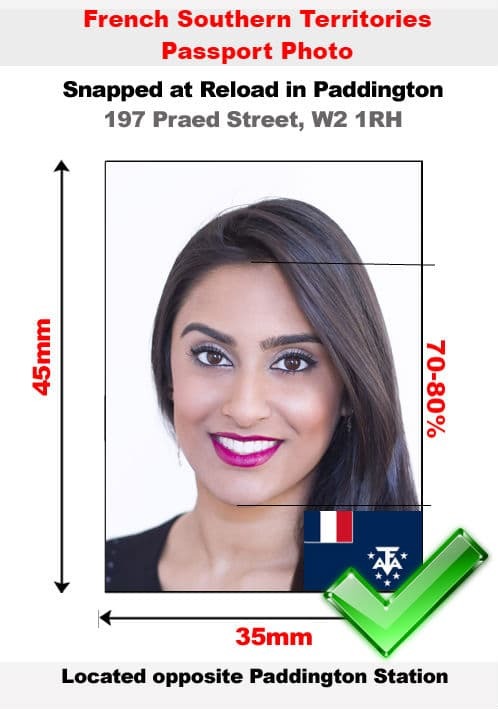 Your photograph must measure 4.5cm x 3.5cm, with 70-80% of the photograph being covered by the applicant’s face. This means that when printed, the length from the bottom of the chin to the top of the forehead must be between 31-36mm. Visa photographs must be 2” x 2”, with 60-70% of the photo being covered by the applicant’s head. It is extremely important that your French Southern Territories passport photo or visa photo meets the necessary requirements listed above, as if it does not, it will be rejected when you attempt to submit it along with your application to the relevant Embassy. 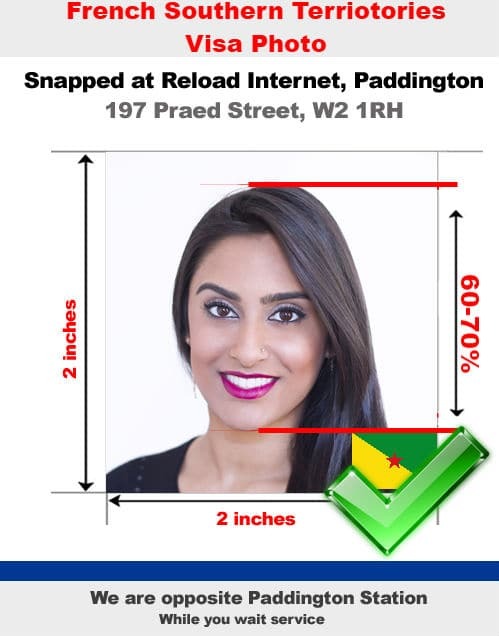 Come to Reload Internet in Paddington, London, and we guarantee that the French Southern Territories passport photo or visa photo we provide you with will pass first time! Our specifications listed above are taken from the French Southern Territories Embassy’s official guidelines on passport and visa photographs which can be found on their website here.